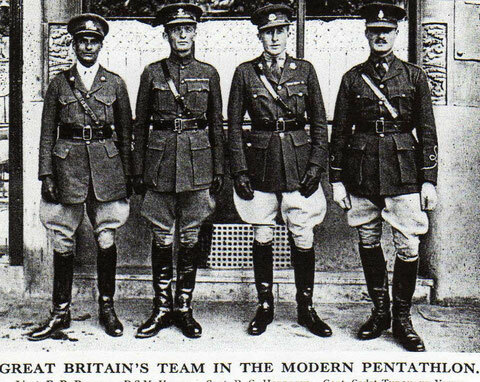 Ten excerpts from 'Modern Pentathlon: 1912-2012' - Website of andyarchibald! The final running event produced such appalling times (between 19 and 24 minutes for 4000m) that commentators have sought to find an explanation. Yes, it was a hot day but a hot day in a Scandinavian country so that can hardly have been an excuse. The run began inside the stadium and was an out-and-back course through the immediate area of North Stockholm. The 1912 British Olympic Report claims that it was an 'extremely tough' course which was 'especially hard for the British runners who were not used to these hills'. Apart from this being a dismal preface to the great tradition of tough British running, it has to be pointed out, too, that the suburbs of Stockholm are not noted for their Himalayan topography. And while in the swimming pool it's true that the standards of the best swimmers in the world at this time were poor, it was far less true for running standards in which track times were entirely respectable. For instance, the British athlete who won the 1500m in Stockholm was timed at 3:56.8. There are several reasons why the running appears to have been so poor and they don't have much to do with weather conditions or hills. Firstly, consider de Coubertin's comment that 'for a cavalry officer...to run cross country on foot, would almost amount to a debasement!' The competitors in the 1912 Modern Pentathlon were all pretty much cavalry officers or, at least, of equivalent disposition. It was possibly a matter of class to leave running to others while the real chaps hunted big game, played polo and fought duels. Secondly, there was no walk around the course beforehand and, apparently, no markers on the course itself. Competitors were given a map immediately before the start and had to calculate their way round. This would have been essentially orienteering without compasses! Photographs of the runners in the Stockholm event, however, do not show any maps clutched in the hand although the effects of the pleasant summer’s day do show clearly on the faces. It seems unlikely that runners were left completely in the dark about the route, though. Thirdly, the course was said to be 'about 4000 metres in length'. It is likely that it was very much longer. The exact distance will not have been a crucial issue and if the natural undulations around the stadium could have been put to more aesthetic use by adding a few hundred metres, that is likely to have been the outcome. The American, George Patton, apparently 'started like a 100 yard sprinter but it was only by the employment of an incredible degree of energy that he managed to stagger past the tape'. He had been given a dose of ‘hop’ or pure opium immediately before the start and fainted at the end of the race. Having risked his life in this way, he took several hours to come round fully. The eventual winner on 19:00.9 was Gösta Åsbrink (Sweden) who hauled himself into the silver medal position with this run. Patton's incredible stagger got him into 3rd place in the running (5th overall). However, it was the top Swede, Gösta Lilliehöök's quiet 5th place in the run that won him the gold medal and lasting glory. Two larger-than-life characters from the British team at the 1924 Olympic Games in Paris. “I was fortunate enough to win the championships in this country and so was selected with three others to represent Great Britain in the Olympic games which were held in Paris that year. For four months we were struck off all duties in order to train and at the end of this period I was superbly fit but the standard of performance in Paris was so high that I finished well down the order of merit. Unlike certain other international contests this particular event seems to spread a spirit of friendship and co-operation among the competitors – a very important factor in the shrinking world of today. Horrocks’ great skill was his ability to communicate which made him popular as a soldier and, in retirement, as a TV presenter of military programmes. As a young man, he had fought against the Bolsheviks, having learned Russian as a prisoner-of-war. In later years, he was a familiar figure as Black Rod in the Opening of Parliament. The 4000 metres cross-country running took place at Wannsee Golf Club and involved a difficult route through steep ravines, forest glades and meadows. Though comfortably in the lead, Handrick (GER), in the Olympic film, is seen to be in a dream-like state at the start and, when given his starting orders, appears to spring into action from complete stillness. 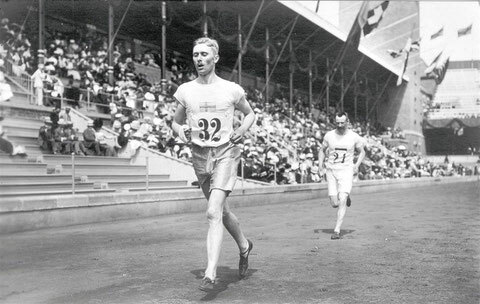 The event was won by the Austrian pentathlete, Karl Leban, in 13:17.4 and the British runners, Legard and MacDougall, who had placed 1st and 2nd in Los Angeles in 1932, came 4th and 6th respectively in Berlin. MacDougall, apparently, had ‘the leather of one of his shoes burst’ on his run. He stopped twice to try to remedy the problem but, 300 metres from home, kicked off the shoe and ran barefoot. Even more impressive was Dodd Starbird (USA) who, despite his painful broken metatarsal bone, managed to complete the competition with a 7th place in the running. 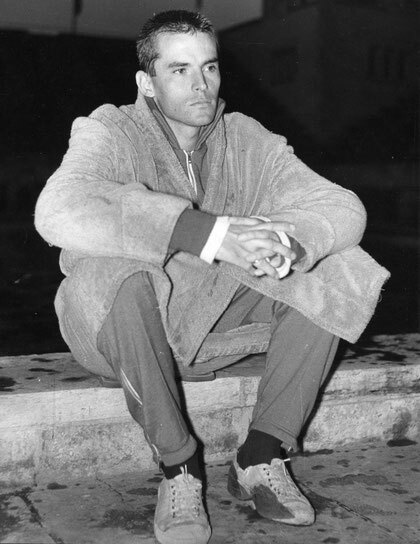 While Charles Leonard, his team mate and friend, toured Europe for a few weeks after the Games, Starbird had to return home promptly with his foot in plaster. So close were the two team mates that, in later years, Leonard’s daughter married Dodd Starbird’s son. Though he only placed 14th in the running, it was enough for Gotthard Handrick to win the Olympic title by 8 placing points. This was the first time Sweden had failed to win since the birth of the sport in 1912. Handrick was to become a fighter pilot after the Games, fighting for the fascists in the Spanish Civil War. As a Major in the Luftwaffe, he was awarded the German Cross in Gold. He survived the war. 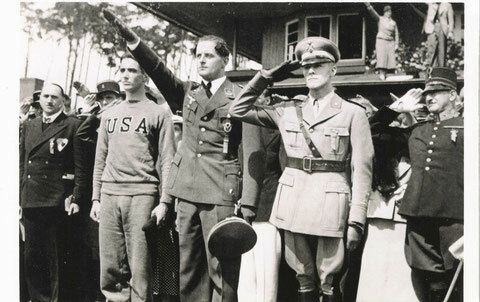 Hitler was so pleased with Handrick’s Olympic victory that, the very next day, Handrick was promoted to Hauptmann. The silver medal went to Charles Leonard (USA) who, like Handrick, only finished outside the top 10 in one event. Leonard’s record in the shooting (200, a maximum) would, of course, never be beaten although targets would change shape in future years and so new records would be set. In 1958, on a trip to Germany, Leonard met Handrick once again. Leonard retired as a Major General and died aged 94 in early 2006. He was buried in Arlington Cemetery alongside his brother, a Navy Admiral. The bronze medal went to Silvano Abba (ITA) who edged the former champion, Sven Thofelt (SWE), into 4th place by just 1.5 place points. Abba was the only one of these four men who died in World War II. He was killed at the Battle of Izbushensky near Volgograd as one of the 700 riders of the Italian Savoy Cavalry who made the last cavalry charge in military history. 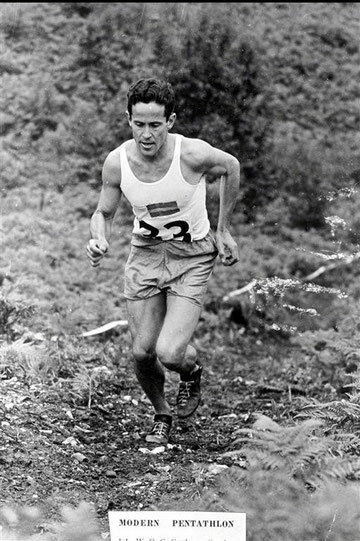 The British team finished 13th (Jeffrey MacDougall), 19th (Percy Legard) and 31st (Archie Jack). The three medallists were presented with laurel leaf crowns soon after the running event but the medals were presented the next day in the Olympic stadium. Perhaps even more significant than his breath-taking victory in 1948 was his enormous influence on the sport as Secretary-General of the UIPM from 1960 to 1984. Grut managed the Swedish team until 1960 before devoting himself to serious UIPM business. Grut’s father, Torben Grut, had been the architect who designed the 1912 Olympic Stadium. Wille had been a good student and was all set to study medicine at Cambridge when the collapse of Ivar Kreuger’s business empire in 1932 robbed the Gruts of all their money. So enormous was Kreuger’s influence that he controlled 64% of the entire Swedish Stock Exchange and thousands were bankrupted by the collapse. Instead, Wille Grut became a soldier. That cost his family nothing and set him underway on a highly successful sporting and military career. As a young man, Wille represented Sweden in the swimming at the 1936 Berlin Olympics where he also watched the pentathlon events. In witnessing Handrick’s win which brought to an end the unbroken success of Sweden did he vow revenge for his home country? Whatever his motivation, he became Swedish Modern Pentathlon champion five times between 1939 and 1948. By the time he arrived in London for the 1948 Games, he was only a month short of his 34th birthday. Grut no doubt gained training opportunities through Sweden’s wartime neutrality, but Grut’s sporting career would have been even greater had the world not been at war and he had been able to compete in international competitions. He later rose to the rank of Lieutenant Colonel in the Swedish army and was a much-admired leader of his men. Like every other Swedish Olympic champion before him, Grut was a member of the prestigious Royal Svea Artillery Regiment. In his early training, Bengt Uggla, who had placed 4th in the 1920 Olympic Modern Pentathlon, told him, ‘Play sport until the day you die, but do not let sport be the death of you’. Grut remembered this and, at 97 years old, has only recently cut down on his daily swim and gym workouts. He lives in the Swedish lakeside town of Őstersund. A highly intelligent and affable man, Wille Grut has smoothed the way for the survival of Modern Pentathlon in the modern era, as will be very evident in the coming chapters. Of the respect due to the great administrators of Modern Pentathlon, our sport owes him the most. Great Britain is the only nation in the world to have competed in every single Olympic Modern Pentathlon competition from 1912 to 2012. It’s true that real success for the British team has been very thin on the ground until comparatively recently but, often, the actual physical difficulty of getting to the championships would have deterred lesser beings. Great Britain is not alone in this achievement but, as a tribute to all those from any part of the world who have merely attended a big competition and been proud to get there, consider the plight of the British team in Melbourne in 1956. 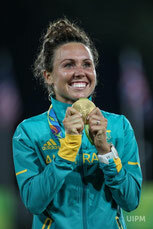 The BOA had assured the MPAGB that they could only afford to send a single pentathlete to Melbourne. In such circumstances, squad training would seem to be unnecessary. Not until late July of 1956 did the BOA change its minds and allow three pentathletes and a manager to travel. Furthermore, the BOA wanted the names by early September. It was never easy to negotiate the release of military personnel but by late August, ten ‘hopefuls’ were in training, assisted by ex-Olympian, John Hewitt, who had recently broken his leg in a point to point race. The team had to be selected before the British Championships when the exhausted selected athletes might well lose to fresher athletes- a precarious position for the selectors. 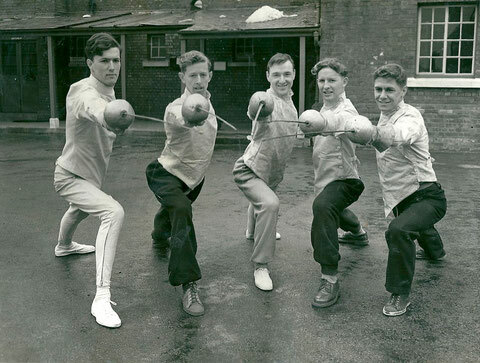 Fortunately, the team selected consisted of the 1955 British Champion, Sgt Don Cobley (RAF); CSM George Norman, who regained his British title in the 1956 competition; 20 year old Cpl of Horse, Tom Hudson and the non-travelling reserve was SSI Michael Howard, all of whom, fortunately, performed well in the British Championship. The complete absence of officers in the team was a thorough break with the past and threw the Team Manager, Lt. Col. OG (Geoffrey) W White, DSO OBE, into some confusion. Since White was quite sure the lower ranks lacked the ‘mental stamina’ of the officer classes, he engaged a Dr Kemp, a Scientologist, to work with the team and give them a psychological boost. These services, like anything that came the team’s way, were given completely free. The team, then, set off for Melbourne after about nine weeks’ training. Meanwhile, the USA team had been training hard together in Texas for nearly two years and the Soviet Union had a programme of intensive training for a large squad that had been underway since Helsinki. With the prospect of the team being robbed of a chance to compete through the injury, Michael Howard had been hurriedly flown out by RAF carrier and arrived in Melbourne just a few hours before the riding event began. As it turned out, the original team members were all able to compete and Howard had to watch from the side lines. Howard nevertheless competed in the fencing events in Melbourne. Having been in the Modern Pentathlon squad since 1950, he now went on to compete in three Olympic Games (1956, 1960, and 1964) in fencing, winning a team epée silver medal in Rome. Back at the riding, since other ranks, unlike officers, did not have appropriate riding uniform, Moss Brothers had provided uniforms of a light tropical material for the team. The day of the riding was chilly and misty. Even our plucky chaps must have had a sense of foreboding as the competition began. 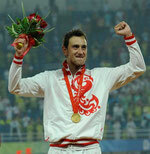 Though World Champion, the most important absentee from Tokyo was Andras Balczó. Even in early summer of that year he was winning international competitions but then, together with his Hungarian teammate, Istvan Mona, he was jailed for a year for smuggling Swiss watches into Rumania. The Iron Curtain was the perfect backdrop to stimulate trading activities for those sportsmen lucky enough to be able to travel abroad. You can be sure Balczó and Mona were not alone in seeking to plug a gap in the trading market and Western athletes were also sure to take saleable supplies with them whenever they went into the Eastern bloc. It meant that Hungary’s top pentathlete would miss the Olympic Games. This was an extraordinary action for the Hungarian government to take but the decision to jail him may have had something to do with Balczo’s uncompromising character. Andras Balczó was born in Kondoros and grew up in Nyiregyháza in North East Hungary, the son of a Calvinist pastor. He came to Budapest at the age of 18 as a typewriter mechanic and two years later was visiting Aldershot for his first World Championship. Though World Champion for the first time in 1963, divorce from his first wife, the jail sentence and the missed Olympic Games must all have contributed to a low period in his life. For those of us lucky enough to have seen this tall, elegant, calm athlete in action, it comes as a surprise to learn from Sándor Dávid’s book, Balczó, (Sport 1973), that Balczó was a man wracked with anxiety and insecurity about his own sporting genius. After the Rome Olympics where the team members were deprived of their regular coaches, Balczó resolved to be his ‘own coach and trainer’. He was a member of the Csepel club, the Metal Workers’ Union, and this set him apart from the Honved, ex-military team, which dominated Hungarian pentathlon at the time. Ferenc Török, a lawyer and, in more recent years, a politician and UIPM Vice-President, was Honved’s top man. Though Balczó became an agnostic Christian during the early years of his time in Budapest, a ‘road to Damascus’ moment brought him back to the church and his outspoken attacks on the Communist regime and, in modern times, on the more liberal ‘euro’ government in Hungary have made him, in many ways, the black sheep of the Modern Pentathlon world. 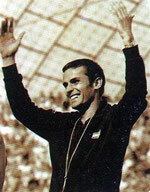 After Olympic victory in Munich in 1972, Balczó retired but, despite his fame (a biographical film, Kűldetes –‘Mission’, was made about his life), was given no significant role in the Modern Pentathlon world. He worked in an undemanding job at the National Horse Breeding Inspectorate until he walked out entirely on the whole set-up, insisting he would have nothing more to do with the sport in which he had been a hero. He refused all approaches from his Hungarian pentathlon colleagues thereafter and it is only recently, in his seventies, that he has softened a little. He attended the 50 year reunion of the Rome Olympics and has recently been pictured with other Hungarian champions. In 1973, Balczó married Monika Csaszar who, at 17 years of age, had won a bronze medal in Gymnastics in Munich. Together they have produced twelve children, Balczó joking that he ‘became a father of many children because of the lack of self-restraint’. Nowadays, he is a leading member of the Jobbik (JMM) political party and has a strong anti-abortion stance. Right-wing in attitudes, the party is, nevertheless, Hungary’s third strongest political movement. Balczó enjoys talking to young people about his faith and beliefs. It is a great shame that he was deprived of contributing his expertise to future generations of pentathletes. Naturally, the team competition would be between the Soviet Union and Hungary; nobody else had won it since 1953. The Soviet Union had brought back the 39 year old Boris Onischenko after his absence the year before. Three times World Champion, Pavel Lednev and Boris Mossolov made up the rest of their team. The Hungarians, still a young team, retained their 1975 winning line-up of Maracskó, Kancsal and Sasics. In competition for the bronze medal would probably be West Germany (Esser, Werner, Koepcke), USA (Fitzgerald, Burley, Nieman), and Great Britain (Parker, Nightingale, Fox). The Czechs (Bartu, Adam, Starnovsky) were outsiders and hadn’t even attended the World Championships the year before. Pavel Lednev was hot favourite for the individual title. The riding event took place at Bromont, 85 km outside Montreal on a lovely site. 13 riders scored a maximum 1100 including Jim Fox and Adrian Parker. The World Champions, Hungary, had a terrible start with scores of 866, 972, and 934 which left them very vulnerable. The fencing event, most notable for Onischenko’s disqualification and, therefore, the elimination of the Soviet Union, blew the competition wide open, particularly since Hungary had started so badly. Lednev won comfortably with 1096 ahead of Kancsal (990) and Jan Bartu (976). The top scores were more widely spread than usual and consequently lower; this played into the hands of the British team whose usual 700+ scores did not do so much damage to their overall position. Jiri Adam (TCH) won the shooting with 198 while Nightingale shot 191, Parker 188 and Fox 187. The West Germans, whose shooting had been awe-inspiring in previous years, did as inexplicably badly in Montreal as they had done in the fencing event. This eliminated them from the team reckoning. The USA team also had a disaster in the shooting when Burley (180) and Nieman (176) fell apart. After three events, then, the Czech team led with the British team back in 8th position. Though each member of the British team swam the 300m course in their best times (Parker 3:24.3, Nightingale 3:32.7 and Fox 3:44.2), the event was won by Bob Nieman in 3:13.5. With only the running to go, Great Britain, now in 5th position, had to run the 4000m course three minutes faster than the young Czech team, 75 seconds faster than Hungary, 50 seconds faster than Poland and 44 seconds faster than the USA if they were to win. Adrian Parker, the first to go off in the one minute interval start, set an unbeatable winning time on a tough course of 12:09.5. He was comfortably ahead of strong runners, Mike Burley (12:26) and Janusz Peciak (12:29). Danny Nightingale (12:32) and Jim Fox (12:47) ensured a decisive British team win in the running but was it enough to win the competition? Details were slow to emerge. Eventually, the overall result actually gave victory to Great Britain by quite a margin: 15,599 to Czechoslovakia’s 15,451 and Hungary’s 15,395. Individually, Janusz Peciak’s run took him past the hot-favourite Pavel Lednev to win individual gold and Jan Bartu took the bronze. The British placings: Adrian Parker 5th, Danny Nightingale 10th, Jim Fox 15th, surpassed all expectation. 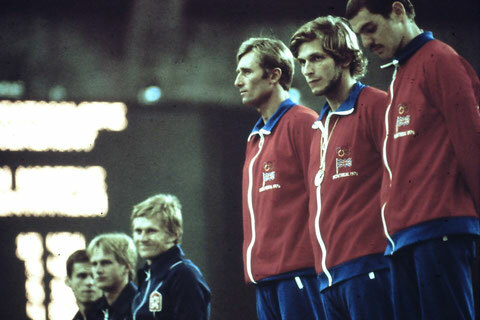 The victory turned the team competition upside down; it would be four years before the Soviet Union won again and eleven before Hungary did the same. 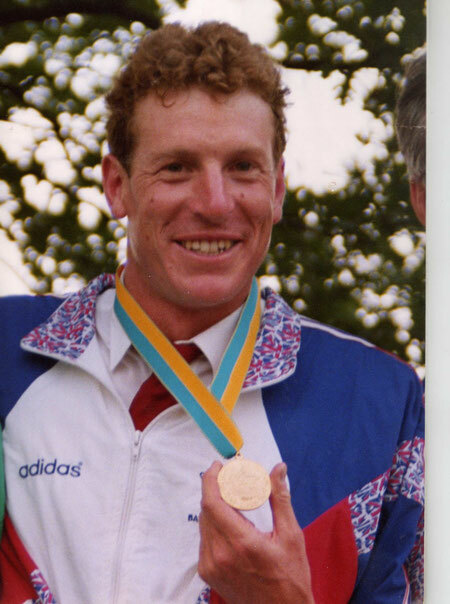 Jim Fox was able to retire at the top of his game, bronze medallist in 1975 and the award of the Unesco Fair Play Trophy, and gold medallist in 1976. The second annual World Championship for women was an unforgettable one for Great Britain. Among the 30 individual competitors, there were seven teams entered - Australia, France, Germany, Great Britain, Sweden, USA and, for the first time, USSR. Poland and Italy, present the previous year, were, sadly, absent. The competition took place over five days in mid-August in the order: ride, fence, swim, shoot, run, the last day’s run being postponed until early evening because of the 90F heat. Kathy Tayler (GBR) was one of two clear rounds in the riding and, though Wendy Norman (GBR) fenced 1032, that event was won by Ameyalli Martinez (MEX) with 1114. Guylaine Berger (FRA) won the swimming (1244) and Sarah Parker (GBR) the shooting with 1000. Wendy Norman’s storming run (1285 points) gave the 16 year old a comfortable World Championship victory by 175 points ahead of Sarah Parker and Kathy Tayler who took silver and bronze medals. There were many notable pentathletes in the field: the 1981 Champion, Anne Ahlgren (SWE) finished 4th; Lynn Chornobrywy (CAN), who would become World Champion a year later, scored zero in the riding, just as four-times World Champion (1990, 1991, 1993, 1994), Eva Fjellerup (DEN), had done the year before. Pernille Svarre (DEN) finished 6th, 19 years before she would become the 2000 World Champion. Like Pernille, Caroline Delemer (FRA) would still be competing 20 years later and would take the bronze medal in 1988 and 1989; Sabine Krapf (FRG) would take bronze in 1986 and 1987; and Sophie Moressee would win the silver in 1986 and become a member of France’s Olympic Gold medal winning Epée team in 1996. 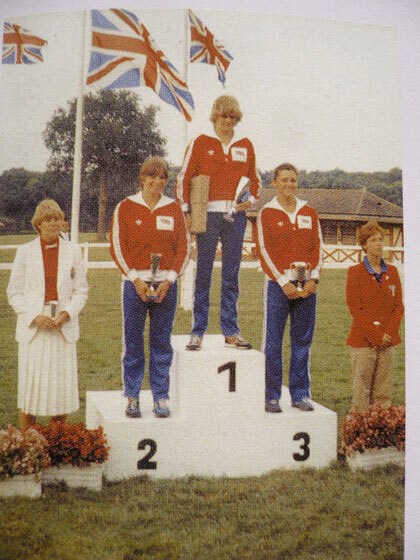 Though only 19, this was the final competitive season for Great Britain’s Kathy Tayler who went on to become a popular TV presenter, her rigorous pentathlon training equipping her well for an early morning start on the breakfast show. This was the first World Championship to take place on a single day. For one athlete in particular, however, the greater the chaos the more he felt at home. Richard Phelps had begun the year with success in Australia but, at the European Championships ride, he had fallen badly and torn the ligaments in his shoulder. Though he was the only British qualifier of the 32 competing in Darmstadt, he spent six weeks without training in four of the five events and went on holiday to Majorca, keeping generally fit with a little triathlon. When he arrived in Darmstadt he was fully expecting to achieve nothing. True, of the 12 who had beaten him in Barcelona the year before, only Mizsér (HUN), Gostigian (USA) and Deleigne (FRA) were present in Darmstadt but Fábián (HUN), Toraldo (ITA) and Ruer (FRA) were all having good seasons. A team relay prefaced the individual competition. Phelps, meanwhile, watched from the stands. Later he was to appreciate the low-key nature of his experience in Darmstadt. He had had the benefit of psychologists, masseurs, and a whole support team at the Olympics but such backing can also bring added expectation and therefore pressure. With only his uncle, Robbie Phelps as coach and Martin Dawe as manager with him in Darmstadt, he was able to relax more. The first event was the shooting, an event that had often let him down in the past, and Phelps shot 193. Only Ismo Marjunen (FIN) shot better (194). Though Ruer and Toraldo swam better than Phelps, Richard’s 3:21.5 kept him in touch. Despite being six seconds down on his 1992 performance, his lack of expectation lent a far better sense of pacing to both his swim and his run in this competition. His 880 fencing score fell below his fine Olympic effort the previous year and Laszlo Fábián’s winning 1120 gave the Hungarian a 148 point lead over Phelps after three events. The running event was a pack start and this played directly into the hands of a strong runner like Phelps. He finished 2nd in 12:21, just one second behind Peter Steinmann (SWI) thus reducing Fabian’s overall lead to 40 points. Concluding with the riding event is a concession to spectators but not to pentathletes. Richard drew a difficult horse which had not gone well in the first round. The advice he got from Uncle Rob proved to be excellent and he rode a clear round for 1100 points. There have been many family coaching relationships in Modern Pentathlon and family tensions can often prove detrimental to such a set-up. By 1993, Richard is the first to admit, it was a coaching relationship that really worked well and one for which he is grateful. Though 20 out of the 32 competitors scored over 1000 points in the ride, Lazslo Fábián wasn’t one of them. He scored 974 and slipped into the silver medal position, ahead of Sebastien Deleigne but behind Great Britain’s first and only male World Champion, Richard Phelps. In an interview after Darmstadt with Andrew Longmore in The Times, Richard was quoted as saying ‘I just don’t rate full-time training’. Realising that driving all over the place in a hectic rush to gain experience was not for him he added, ‘Stuff it, I’m going to stay where I am, relax and train at the level I enjoy.’ For all those coaches who might throw up their hands in horror at such a concept, it should be noted that Richard Phelps’ career in Modern Pentathlon was a very long one. By the time he became World Champion in 1993, he had been competing for 21 years. He was to continue in the sport for a further seven years. Though the tale behind his becoming World Champion against all the odds is the stuff of boys’ comic books, when he climbed on to that podium in Darmstadt, he was carrying the experience of many years at the highest level, not the training of just the past few weeks. His position as a World Champion has been underrated in the history of British sport and that is as much to do with Richard’s self-effacing, good-humoured nature as it is with the appalling neglect of his achievements by the British press. 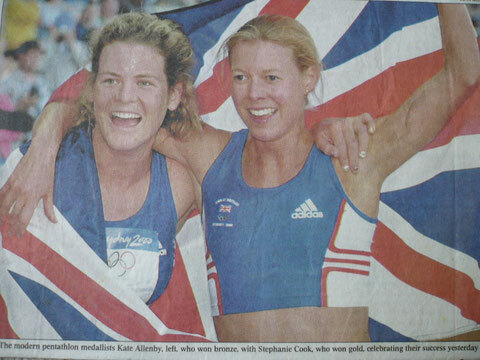 For Great Britain, the gold and bronze medals won by Steph Cook and Kate Allenby in this event are the stuff of legend. There was ample evidence from the team medals at recent major events that our women were in with a chance but the outcome was beyond dreams and for Steph Cook, turned her into the kind of media celebrity from which only her experience and ambition as a level-headed doctor could ever allow her to escape. The day (1st October) began with Emily de Riel (USA) opening up a strong lead by shooting 185 compared to Cook’s 178 and Allenby’s 175. Though Kate fenced a strong 920, Steph only managed 760 and was six seconds down on Kate in the swimming, an event won by Zsusza Vörös in 2:15.8. The riding event was kind to the final top six, all of whom scored 1040 except de Riel who scored 1070, but hard on some big names. Former World Champion, Elizaveta Suvarova (RUS) scored only 827, 2000 World Champion Pernille Svarre (DEN) scored 702, and 1999 World Champion Zsusza Vörös scored 830. Steph Cook started the run in 8th place with 49 seconds to catch on Emily de Riel. Ahead of her was also team mate, Kate Allenby. Steph was, of course, in the great tradition of British pentathletes, a fine runner. She had placed 7th in the National Cross-Country Championship as she had done in 1997 and gone on to represent Great Britain in that sport as a result. At the halfway stage, Steph had closed the gap on Emily to 15 seconds. With 750 metres to go, she overtook Kate and then, with 300 metres remaining, overtook Emily. Her final time of 10.03 was 51 and 55 seconds ahead of de Riel and Allenby respectively who took the silver and bronze medals.